Mama needs some accessories to go with her new top! I am not a huge accessory person (except for shoes, of course). But with all the inspiration out there, I just couldn't resist adding some bling to the Mama's Day outfit. It should be about 12 inches long, 2 inches across the top and 1/2 inch across the bottom. Finish the edges of the fabric-- or you could even leave it raw for a different look. Starting at the narrow end of the fabric and start making tucks toward the bottom. Pin them into place and stitch a line down the middle of your ruffle piece, keeping the gathers in place. 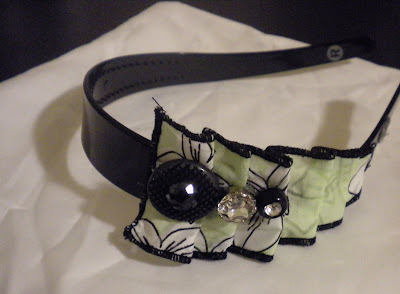 Use some hot glue to stick the ruffle onto the headband. Fancy vintage buttons are perfect for the bling (whatever am I going to do when I run out of these fab buttons?). I used some needlenose pliers to cut the little loopy thing off the bottom of the button. A little hot glue to attach them and done! I love it! It's so pretty with out be overly fussy. Thanks for sharing. I am totally trying this! I love it! Wow, you're just branching out into everything and sooooooooooooooooooooo creative!!! I'm lovin' your accessories! I love the pretty, yet grown up look to this headband, so cool! Love these ideas for dressing up the plain jane stuff into one of a kind....you certainly do have an eye for it!